Win 2 tickets to see Machine Drum and Om Unit live in NYC this Saturday! 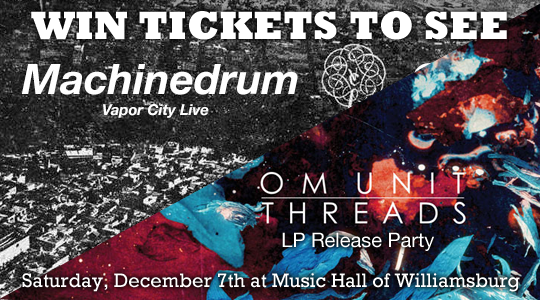 WompBlog is stoked to announce that we’re giving away a pair of tickets to the Machinedrum and Om Unit show at Music Hall of Williamsburg. Not only is this the NYC debut of Machinedrum’s Vapor City Live Tour, but it’s also the record release party for Om Unit’s truly outstanding Threads LP (out now on Civil Music). Both albums are some of the best bass music of the 2013, exploring the vast frontier of jungle, juke and all manner of nascent halftime mutations. The show also features Nick Hook, a DJ set from Body Language, and special guest, Brooklyn’s own Angelica Bess. Angelica sings in Body Language and on the third track of Vapor City, Center Your Love, which you can hear/see in this very nice Vapor City World Tour trailer. Edit as you see fit, just tweet something about winning tickets to the show with that link (bit.ly/vaportix) and you’re entered. Everyone who signs up for the WompList between now and Friday will be entered to win. What is a WompList, you ask? It’s a friday afternoon email breaking down the best upcoming bass music events in NYC. Existing Womplist members can enter by replying to this weeks WompList.